A picture began circulating in November. It should be "The Picture of the Year," or perhaps, "Picture of the Decade." It won't be. In fact, unless you obtained a copy of the US paper which published it, you probably will never see it. The picture is that of a 21-week-old unborn baby named Samuel Alexander Armas, who is being operated on by a surgeon named Joseph Bruner. The baby was diagnosed with spina bifida and would not survive if removed from his mother's womb. Little Samuel's mother, Julie Armas, is an obstetrics nurse in Atlanta. She knew of Dr. Bruner's remarkable surgical procedure. Practicing at Vanderbilt University Medical Center in Nashville, he performs these special operations while the baby is still in the womb. 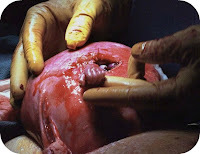 During the procedure, the doctor removes the uterus via C-section and makes a small incision to operate on the baby. As Dr. Bruner completed the surgery on little Samuel, the little guy reached his tiny, but fully developed, hand through the incision and firmly grasped the surgeon's finger. In a Time Europe article highlighting new pregnancy imagery that show the formation of major organs and other significant evidence of the formation of human life but a few days after conception, Dr. Bruner was reported as saying that when his finger was grasped, it was the most emotional moment of his life, and that for an instant during the procedure he was just frozen, totally immobile. The photograph captures this amazing event with perfect clarity. The editors titled the picture, "Hand of Hope." The text explaining the picture begins, "The tiny hand of 21-week-old fetus Samuel Alexander Armas emerges from the mother's uterus to grasp the finger of Dr. Joseph Bruner as if thanking the doctor for the gift of life." Little Samuel's mother said they "wept for days" when they saw the picture. She said, "The photo reminds us a pregnancy isn't about disability or an illness, it's about a little person." Samuel was born in perfect health, the operation 100 per cent successful. Now see the actual picture, and it is awesome ... incredible. I always remember my mum telling me that while she was pregnant with me that she had this "feeling" something wasn't quite right. LADIES LISTEN TO YOUR BODIES!!!.. if you to feel something is "off" then see your Doc and demand tests. If my Doc had just listens to my mother then I to "could possible" have had this op and maybe had the chance to live a "normal life" and walk. But instead he decided to go on holidays *rolls eyes*. Please feel free to leave me a comment and let me know your thoughts on Sam's Story <3.